Fall is almost here, my friends. Forget candy apples and halcyon hayrides: we begin the glory days of dumpster diving. It’s cool enough to keep the apples crisp, and warm enough to make the late nights welcoming. While I wouldn’t call myself a freegan, about half of the food that I eat is “rescued.” Though I have the means to buy the food I need, dumpster diving supports the life I want to live: one of generosity, community building, and obscenely good food. It’s also taught me a few lessons, in cooking, in community, and in the inequalities in our food system. So how, and why, do I do this? – socks, pants and shoes that can take a few stains (ie. stray egg yolks, spilled milk). – ethics and decency. See another diver? Share the wealth! Meet a store employee? Be courteous and get out of their way! Clean up your mess! While it’s possible to dumpster without these things, a bit of prep can guarantee a far better, safer haul. Be aware that “processing” takes about as long as the actual “dive,” as leaving your kitchen covered in dumpster food (without a plan) might not end well. Dividing labor can be a great way to include people who may want dumpstered food, but may not be as interested in hauling themselves inside of the beast to find all the tasties. Mr. Wonder, my diving guru and beloved housemate, has been dreaming of a distribution center – a kitchen where divers can meet up, process, and divide spoils more effectively than comparing bags in the back of a parking lot. One of the main reasons I dive is to support my friends — both my housemates (especially Wonder, who is 6’3′ and built to eat), as well as our many guests (yeah, I see you with those eggs, Danimal). It keeps our shared food costs low, and lets us eat together regularly at a much higher standard. Diving helps me really appreciate my friends (especially when they’re boosting me up). Diving itself is incredible. There’s a triumph when you find the huge bag of navel oranges, or the sack of flourless cakes (each individually wrapped), or the mountain of salad packs. It’s pretty fun to dig around inside, seeking the finest treasures of the suburban grocery stores. Whenever I dive, I feel like I’m an all-powerful eight years old, playing manhunt in my friend’s yard, saving treasures from certain destruction. On my first dive, two years ago, in Arlington, I was flabbergasted by the incredible quality and quantity of goods. Avocados, beets, pears, chili packs, fresh chevre, buffalo mozzarella, orchids, bread, bananas, yogurt…. and in three hours, it would all be going straight to a waste treatment plant, somewhere in Pennsylvania. Straight to rot. It was my duty to eat those avocados, to save them from being trashed forever. Though I love diving, I do much more processing because I’m much more pleasant (and productive) at 8:00am than 2:00am. By the same token, processing has a different childlike excitement. It’s like an unexpected Christmas morning — it’s 7:30am, I’m groggy and getting a glass of water in my hoodie and short-shorts, and there are miraculously piles of food all over the kitchen. As if they fell from the sky. And then I eat a breakfast more sumptuous than the goddamn Little Princess. Yesterday night, my house participated in the Group House Olympics, a deeply serious competition between the communal homes in Petworth, Columbia Heights, and other crunchy parts of the District. One of our sweeter housemates, who’s always really excited to cook for large groups, made an incredible brisket to share at the potluck. Through dumpster diving, the brisket was free, and needed to be cooked and shared as quickly as possible. At other potlucks, we’ve brought fancy baked brie, lamb, salsa in bulk, and a whole variety of useful, filling meals. With a harvest mentality and a profundity of resources, generosity is much easier. 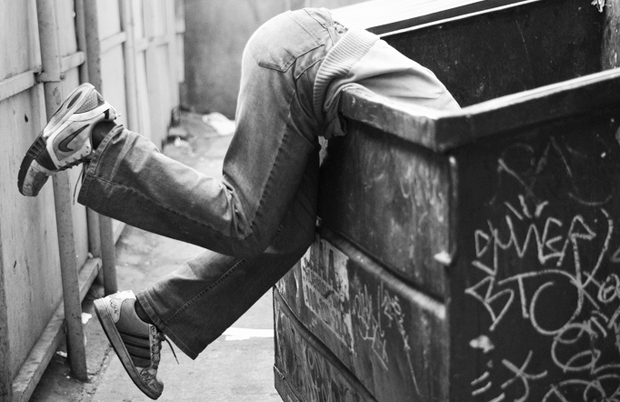 Dumpster diving is a bit like a CSA or a zombie-Costco – items occur in bulk (with a negative shelf-life), and the arrangements are often random. You don’t get five apples, you get two hundred apples. One week, you find 20 packages of yogurt, the next week, you find fifty sealed bags of green beans and twenty eggplants. While you can scarf down that food solo, or within your house (hey there, goat cheese), it’s generally better to share. Actually, strike that: it’s generally better to cook, and then to share. Through dumpster diving, I’ve become a much more capable cook. For food safety reasons, it’s considerably safer to cook most dumpstered foods than eat them raw (though I’ve done my share of that too). We make jams, preserves, chilis, soups, stews, enormous stir fry meals — anything to get food safely eaten is encouraged. Overall, dumpster food — or any shared food — makes communal living substantially easier. While it introduces a few new cleaning obstacles, it provides an incredible shared resource that invites more high-quality group interactions. We don’t need a shared food budget, or any complicated arithmetic in our shared meals. It’s far easier to cook in bulk, and from there, it’s easier to eat in groups, and from there, it’s easier to share so many aspects of life. The slippery socialism of a shared jam jar. Guests are enthusiastically welcomed at my house because hell, we literally need more mouths to feed. We can speak freely in our own home, eating our own food. We build our house into a home. The Lessons: Waste not, want not? Dumpster diving has also highlighted some big issues in our food system that were never as clear to me until I was… knee-deep in them. First, there’s an incredible disparity in food quality based on one’s zip code. While I knew that in theory, the reality is stunning. The grocery stories in Northern Virginia offer a far higher standard of food than any major grocery stores in my area of DC. Even after a few hours in the compost bin, NoVA produce is still unquestionably better. In discussions of obesity, the question of food quality is often a bit muted, but in my thinking, providing quality “healthy” food (ie. whole produce) can change food choice and portion control in meaningful ways. Moreover, the abundance I have as a diver is entirely artificial and unreachable for many of my neighbors. Secondly, we waste an incredible amount of food. We truly, truly do. Remember this viral news clip — Americans waste half their food? The NRDC study by Dana Gunders was covered by Reuters, echoed across the internet with much pontification. Phenomenal waste is so apparent when you dive, because diving isn’t as gross as you’d think. Really. At the dumpsters we’ve gone to, each bag is double-wrapped in plastic, keeping it safe from any weird items lurking in the dumpster. I didn’t even get dirty. And it’s much more productive than I’d imagined. While there is a mild legal “greyness” to the process, dumpster diving may do more to help than harm the stores it frequent, as those stores pay *per pound* for the trash they create. And as my occasionally sore shoulders will attest, we definitely do our fair share to help lighten their load. They’re beautiful little pineapple plants. It’s insulting that someone threw them away. Third, there’s so much packaging that is incredibly wasteful. Even after we’ve eaten much of the dumstered food, our personal trash, as a household, is absurdly massive, due to packaging materials. As a nation, plastic packaging comprises 13% of our “waste stream” – 32 million tons of plastic trash recorded in 2011. Fourth, a majority of our food production sources in this country are (to me) deeply ethically questionable. The commercial meat industry is toxic to both workers and our environment, and the trend towards monocultures, GMOs, and high-pesticide use are morally repellant to me, especially when I consider giving them money and my tacit support. When I dive, I can eat foods I would feel hesitant to buy, and while I don’t appreciate the manner in which animals are kept, I do appreciate not letting their lives go completely to waste. A while ago, we got a huge haul of blueberries — piles and piles and piles. They covered the kitchen counter, about a foot deep. It was as if the sky opened and belched out a metric ton of berries. And, like troopers, we ate them. We gave some away for blueberry pie, we ate blueberry jam, we drank blueberry juice. In this time, I forgot the normal cost of blueberries — they were about as plentiful as water. After the second week of blue teeth, I wondered how many of my food choices were made on the basis of cost versus the benefit of health, even if it was only a paltry difference for a higher-quality brand, or a more nutritious product. I rarely bought larger amounts of proteins because of the higher cost, even if those foods filled me up more productively than produce or starches. My frugality was not sensible, and cost me more money in the long term. Though I wanted to support local vendors and stores with higher-paid staff, I often made purchasing decisions to buy only a few items from those sources, and buy my staples at “big box” stores with shiny discounts. I also noticed that my purchases didn’t coincide with seasons, nor did they include “random” healthy items, while the selections from dumpster diving are often random and/or seasonal. There’s the delicious post-Thanksgiving haul (though we still have a few stuffing mix boxes in the garage from last November. Thanks preservatives! ), and the occasional “absurd bounty” moments. We once scored a box full of honey jars — one had cracked, spilled honey on the rest, which obviously made them un-sellable, and trash, and gave us honey for several months. And we drink some serious tea, and use some serious honey. Once, we found about 20 racks of lamb, each worth around $25 — nearly $250 in delicious, tasty lamb. I got a bit tired of lamb after the second week of it, but that’s a boredom I’m willing to have. Is acting on my privileges wrong? Yes and no. Before dumpster diving, I was barely aware of my food choices, especially in terms of purchasing. I bought low-cost, low-quality foods, in the easiest locations. I had privileges, but I didn’t operate on them. At this point, I have more education, and more to give, both in tomatoes and in an understanding of how profoundly lucky I am. And as a result, I’ve changed my spending and my giving. Through dumpster diving, I allocate my food budget differently, as I have enough leeway to put down my dollar where I want to drop it. Many of us see food consumption as a political act, or as a way to back our ideals, whether we avoid animal products or GMOs, or purchase our food at locally-owned stores. Dumpster diving is a part of that equation for me, of how I spend (and don’t spend) my money. And it means that everyone eats when they come to my house. For more information about diving, and other waste reclamation strategies, freegan.info is awesome. Alex Mallis’s short documentary “Spoils: Extraordinary Harvest” is wonderful and totally worth your time, as is “Dive!” by Jeremy Seifert. This Perennial Plate episode on diving is also remarkable. I am now going to start calling Mr. Wonder “high priest of Dump-Ra.” Because that is a great title. That has a rather charming double meaning. This is all so great to hear about, but also ultimately disturbing to read about the waste. The jars of honey really got me, that’s just maddening. We have a full standing freezer AND two fridges — one private, one public (which is mostly dumpstered food + leftovers). Our freezer is still filled with chicken and bread, I think. Amazing! I always marveled at the number of freezers my grandparents had – they froze what they grew in their garden and caught in the ocean. I think what you are doing is just as noble. One of my favorite dumpstering memories was the time you emerged from the dumpster triumphantly holding a bouquet of flowers and presented them lovingly to Rocketship. You are the master to my master, Justin. All praise to you. I’m curious about dumpster diving but we’re currently living in a tent in my friends’ backyard, so I’m not sure if that’s doable. Plus I have to use a cane. But this was an interesting read! Nope, but close enough, since the post is by my dear friend and housemate in DC. An excellent piece, i am reblogging now. In part excellent because it encourages people who think it is gross or outside their comfort zones to consider it. In part excellent because it also serves as an introduction to food politics, which is important and generally ignored. Also excellent because it is personal, conversational and revealing. Keep resident Reyes lays out the mechanics and politics of dumpster diving. And how her personal journey changed her thinking of food and privileged. I used to do this. Unfortunately they started locking the gates at the shop by my house.